An image taken on the streets of Shanghai China with a Leica M6, 35mm Zeiss lens and Ilford Pan 100 ISO film. 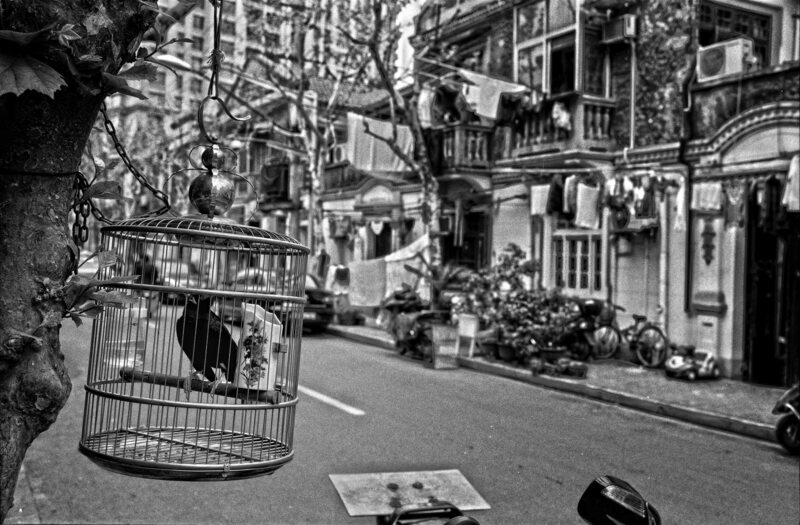 Birds in cages are a very common sight in China, they can be seen in every city throughout this vast country. Retired men gather together in the early morning and early evening to walk their birds often stopping by the local park to show off their birds and discuss birds with their friends,it’s one of the many interesting Chinese customs. They also talk birds, swap and sell birds, and just listen to the chirping of songbirds. Artisans show up at the local bird and animal markets with China’s ornate, graceful birdcages and porcelain water bowls. Others arrive with banquets of bird food to sell-including live grubs-and an occasional antique. How interesting! Lovely photo, too. That must be fun to witness. Birds as pets like you would have as a dog, walking on a leach. I remember many years ago is was normal to see people walk with parrots or cockatoo’s on their shoulders. Yeah it’s difficult, I can see why people want to keep birds, to admire their beauty and listen to their song but on the other hand I would rather see them fly free.